People with Hoarding Disorder compulsively acquire things that often seem to be of little use to the average person. People who hoard have great difficulty discarding these objects. This compulsive acquisition results in major problems to the sufferer due to the massive amount of clutter that physically builds up around them in their home, office, or car. Hoarding can even take over a person's ability to function normally with computer and other media equipment (e.g. ten drives of storage on a home computer). It is common for sufferers to use places like showers, bathtubs, or ovens as extra storage space. Hoarding Disorder used to be considered a subtype of obsessive-compulsive disorder, but researchers have since recognized it as a separate disorder. People who hoard tend to have fewer intrusive thoughts and fewer urges to perform rituals than OCD sufferers. They are typically content with living with their hoarded possessions until family and friends attempt to intervene. They may only become anxious when faced with the possibility of losing their things. They usually feel an emotional connection to the objects, believe it is morally wrong to “waste,” and think the items may be needed later. Left untreated, hoarding will worsen through the course of the years. What is the Treatment for Hoarding Disorder? 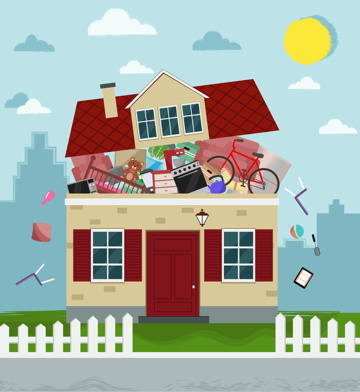 Hoarding is a serious problem and there are several tactics that do not work, including nagging, threats, forced clean outs, and traditional “talk” therapy. Hoarding should be treated with scientifically proven methods such as medication or cognitive-behavioral therapy (CBT). Hoarding therapy is typically a mixture of traditional cognitive-behavioral therapy, motivational interviewing, and home visits with a behavioral coach. The goal is for patients to learn to organize, prioritize, discard unneeded items, and prevent ongoing accumulation. Therapists at the Behavioral Wellness Clinic are experts in treating Hoarding Disorder. Contact us to begin take control of clutter and gain freedom from hoarding. To learn more about the treatment for hoarding disorder, visit OCD Types or read these peer-reviewed scientific articles written by our own clinicians. Worden, B. L., DiLoreto, J. M., & Tolin, D. F. (2014). Insight and motivation in hoarding disorder. In Frost, R. O. & Steketee, G. (Eds. ), The Oxford Handbook of Hoarding and Acquiring. New York: Oxford University Press.